The Chinese government has launched a "patriotic fight" to save its stock market. For China, this isn't just a financial crisis, it's a political one. That's why the Chinese government is doing everything it can to try to stop the bleeding. China's main stock markets are in meltdown mode. Since June 12, the Shanghai Composite has lost an unnerving 32%. The Shenzhen market, which has more tech companies and is often compared to America's Nasdaq index, is down 41% over the same period. On Wednesday, China's Securities Finance Corporation -- known as CSF -- announced that it will lend billions to big Chinese brokerage firms so they can buy more stocks. The goal is to purchase enough shares that stock prices stop plunging. A spokesperson for the China Securities Regulatory Commission called the bloodbath in Chinese stocks an "irrational sell-off," but some called China's markets a bubble this spring. The country's economy is also slowing. 1. The government is essentially buying stock: The CSF is lending $42 billion (260 billion yuan) to 21 brokerage firms so they can purchase "blue chip" stocks. That's on top of what the $20 billion the brokerages vowed to buy over the weekend. 2. China is even buying small stocks: The CSF also pledge to buy more small and medium-sized stocks, although there was no specific amount given of how much would be spent. 3. New stimulus: A new $40 billion (250 billion yuan) plan announced Wednesday to foster growth in areas of the economy that need it most. China's economy has been slowing down. 4. More government spending: China will also speed up infrastructure spending that the government was already planning to do such as building roads and utilities. 5. Over half of China's stocks have stopped trading: China has allowed half of the companies on the stock exchange to halt trading in their shares. 6. Big shareholders can't sell for 6 months: Starting Wednesday, controlling shareholders and board members are prohibited from reducing share holdings via the secondary market for six months. China Securities Regulatory Commission promised it would "deal with them seriously" if anyone violated that rule. 7. No more IPOs (for now): China stopped any new stock listings over the weekend. 8. Central Bank slashed rates: China's central bank has cut rates to a record low in an effort to pump more money into the system. 9. Investors have a lot of leeway now on collateral: Investors now have more options to back their margin trades. Many investors speculated on stocks -- they would borrow money to buy stock because they thought the stock would go up and they would make enough money to pay back the loan and make a profit. Chinese investors can even pledge their homes as collateral, according to Bloomberg. 10. Devaluing the yuan: China's currency has fallen heavily in July against the dollar. There's speculation in the Asian press that it will slide even further. A weaker yuan makes Chinese exports to the U.S. and elsewhere cheaper, so it should help jumpstart growth. So far, all the Herculean efforts have failed to calm the markets. 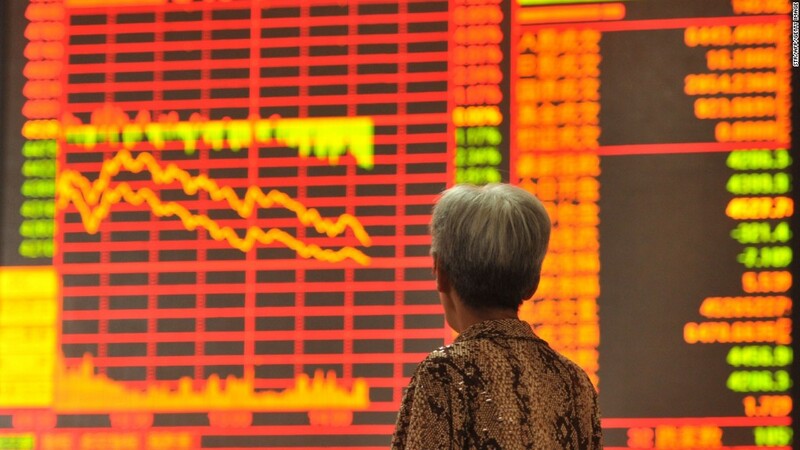 According to Bespoke Investment Group, China's stock markets have now lost $3.25 trillion. To put that in perspective, that's more than the size of France's entire stock market and about 60% of Japan's market. CNNMoney's Charles Riley and Sophia Yan contributed to this story.